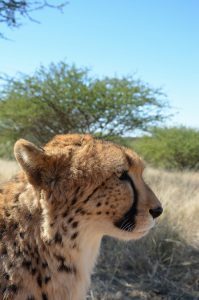 It’s cold here in the Namibian winter mornings, and the cheetah are eager to help with deep learning, in return for a juicy steak treat. 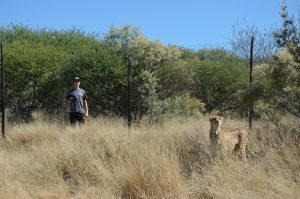 We’re visiting N/a ‘an ku se Wildlife Sanctuary in Namibia to meet with our friends, N/a ‘an ku se founders, Dr Rudie and Marlice Van Vuuren, local ecologist (and soon to be veterinary student) Jo Johnson from Australia, and our PhD student Larissa Slaney from Scotland’s Heriot Watt University. Leading five juvenile cheetah in turn down a prepared sand path, Larissa makes encouraging noises, and holds an even more encouraging bucket of steak. Each cheetah walks across the sand, and leaves footprints that we image as an essential part of our footprint identification technique training database. These juveniles are growing fast, and we need to document how their feet, and thus footprints, are changing over time so that we can continue to monitor them. But this visit there’s a new angle to our research. We want to know if computers, using a technique called deep learning, can identify footprint trails, and perhaps even individuals, from their footprints. Deep learning is developing incredibly rapidly, but so far is no match for the human eye-brain interface. We, along with all vertebrates and even many invertebrates, are expert deep learners from birth, inherently able to perceive and differentiate patterns. The question is, can computers help us sift through thousands of images to make our job of collating them easier? The question is, can computers help us sift through thousands of footprint and animal images to make our job of collating the images easier? Yesterday we had an especially difficult challenge – a sand trail under the shade of a thorny acacia tree. Not only was it a very prickly experience, but the drone had to do some dodging and weaving to get the images needed. But the real challenge will be for the computer. Lighting is everything in vision and perception. Will deep learning be able to even differentiate between the sandy trail without footprints, and with footprints? It was hard for us on the ground to get our eyes to see ‘beyond’ the intense shadows.